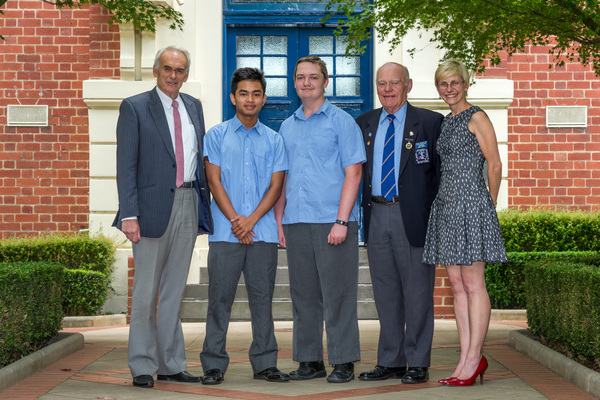 Leading teacher and former Doveton Technical School assistant principal Noel Chapple, recipients Kritsada Nasuri and Jack Taylor, NSAA south-east sub-branch president Mike Smith and Dandenong High School principal Susan Ogden. FIVE Dandenong High School students can pursue their studies thanks to local Nashos. For the past 10 years, the National Servicemen’s Association of Australia (Victoria) South-East Sub-Branch has been providing the financial support. It all started with former Doveton Technical School assistant principal Noel Chapple and NSAA branch president Mike Smith. They were both at a morning tea with the successful students on Wednesday 9 December. Principal Susan Ogden said the teens receiving support for Year 11 studies next year were all from an applied learning pathway. “So they’re students that doing VCAL or vocational learning,” she said. “It’s to prepare them for work. Ms Ogden said the NSAA support helped to build a culture of accepting applied learning as a viable pathway. She said such studies often had additional equipment costs that some parents were unable to pay. Jack Taylor was among the recipients and was described as a diligent student who had displayed a quiet, disciplined and committed approached to his studies. He’s eyeing a carpentry or electrical career. “I’m planning on going into the tradie business,” he said. Jack this year completed a Certificate II in building construction. “In Year 9 a handful of students were offered to do their first year,” he said. Next year he plans to study electro-technology. Fellow recipient Rahma Saadaldeen was described as committed, dedicated and very hard-working, and VET electrical student Kristada Nasuri had a positive attitude to studies and completed all his work to a good standard. Tom Vu was rewarded for his excellent attendance, enthusiasm and willingness to give tasks a go in his VET Hospitality studies. Jessica Paises had an excellent attendance and was described as a polite, focused and co-operative student who was hard-working and tried her best at all times. The National Servicemen’s Association of Australian represents the 287,000 young men the government called up for service during two conscription schemes.